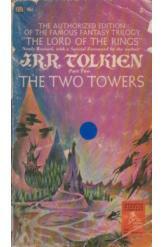 The Two Towers by JRR Tolkien, Sci Fi. Book is in good condition, all pages intact. The fellowship has been parted, with Frodo and Samwise - joined by the corrupted Gollum - bearing the ring toward Mordor while Gimli, Aragorn, and Legolas rally the kingdoms of men against the treacherous Saruman. Book two of The Lord of the Rings trilogy.